When is the full program known? The program will be gradually completed and announced during the summer of 2017. In September, the program will be more or less complete. Tickets are available at the Central Hangout of the festival near to Kantine Walhalla. Do note that the door sale is more expensive The door sale start at 16:00 near to Kantine Walhalla. Is it possible to buy tickets at the specific venues? Is it true that there is only one ticket for all shows? Yes, this is true. However, there will be plenty of comedy that can be attended free of charge on locations that are to be announced. Since capacities are limited, can I make reservations a specific show? No, this is not possible. It is therefore recommended to travel to your location of choice in a timely fashion. And when will the full schedule including timetable be announced to the public? Step by step we will announce the full schedule but tickets will go on sale on the 6th of July 2017. The schedule is subject to change at the sole discretion of the festival producers. Are all shows in English? 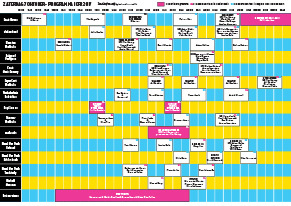 No, there are also many shows in Dutch, which will of course be clearly indicated for our non-Dutch-speaking audiences. Suppose I run late for a specific show. Can I still get in? We have to be clear on that: the answer is no. So please, make sure you get to your location of choice in a timely fashion. I got to the location in time, but it was a full house already. What to do? We're afraid that in this case you'd have to choose another show, as we can only allow a limited amount of visitors to enter the venue. Suppose I don’t like the show I attend. Can I leave at any time? This might vary for the different locations, but as long as you won’t cause too much of a stir, you are free to go. Note well: one cannot go back in! I love improv-comedy, but I don’t want to be part of the show. Any tips on how to prevent that from happening? No, but it will definitely not help if you’re late or draw attention to yourself in any other way. I have a physical impediment. Is the festival accessible to people in wheel chairs? How are catering and sanitary facilities? Upon being a festival, we provide all things natural to a festival, such as catering and toilet facilities. What about the sale and consumption of alcohol? We allow the consumption of alcohol to those who have reached the legal drinking age of 18. Drinking alcoholic beverages is permitted within the boundaries of the festival and it is explicitly prohibited to bring your own drinks. Outside of the festival's boundaries, drinking is prohibited and you therefore risk a substantial fine, as reinforced by Dutch police. Can I participate in the festival itself and be discovered as a comedian? Yes, you can take part in our ICFR Talent contest, shortly to be announced on Facebook. How can I keep up with the latest ICFR news? You can sign up for our newsletter, like us on Facebook and follow us on Twitter, Youtube and Instagram! My question is not listed. What to do?